This letter is about a month late, but then, that's the way things have been here since January. I had meant to write earlier and thank you for your hospitality to myself and MIchael Dooney when we came down to White Plains for Ted's show. The meal and the company were excellent, and I thank you. I hope you and Roy are doing well… Kev and I are looking forward to seeing you at the June 15 show in NYC. Take care! P.S. I'm also enclosing a couple of copies of Gizmo #2, hot off the presses! and possibly some information about a new project for next year that you might be interested in." 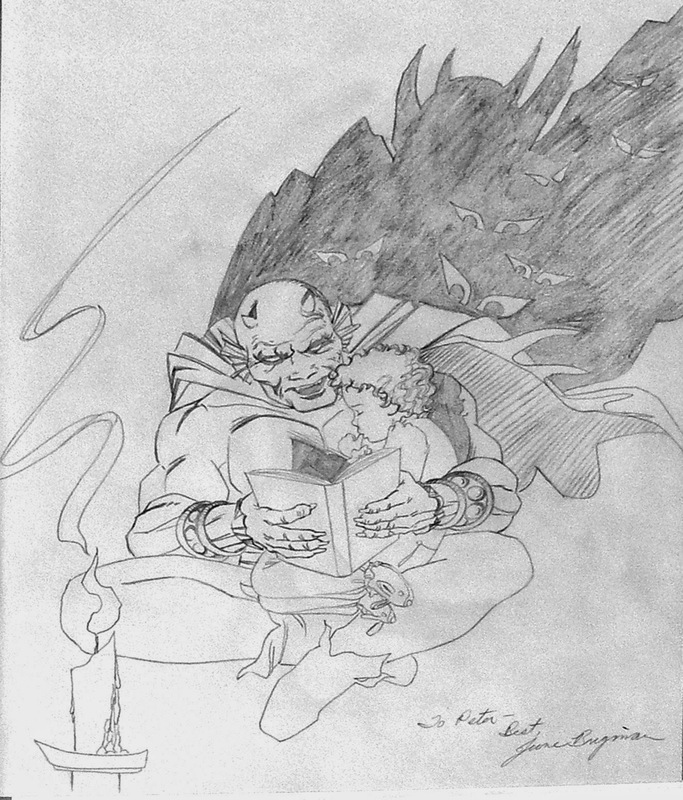 There are other sketches of Jack Kirby's "Etrigan the Demon" character by various artists on that blog, if you care to see them. The show in White Plains, NY was notable for meeting June and her husband Roy, but I also recall another thing which happened there -- I saw my first attempt to create a counterfeit TMNT #1, first printing. A kid came up to my table and asked me to sign his first printing of our first issue, but when I opened the front cover, I had to give him the bad news: Someone had sold him a second printing, with the word "second" whited out (with actual "White Out" correction paint!) and "first" written in its place. There's something wrong with the link. It's not working.